So good, they named it three times. Well, four actually, if you include this month's featured species' scientific name which is Pterygoplichthys scrophus. So out of alligator pleco, chocolate pleco and rhino pleco, which one is the best? 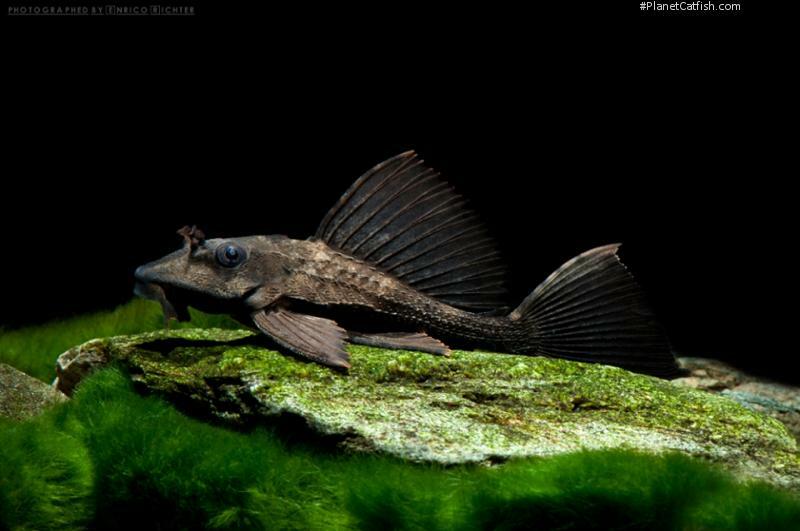 The name alligator pleco is in reference to the four lines of alligator-like keels which are prominent in the species at all ages. These run from head to tail and are perhaps more noticeable because this species has no spots or stripes to break up the lines of these keels. These are sharper and more spiny nearer the head. This armour grows more impressive with age. This lack of patterning gives rise to another common name, chocolate pleco. And that's perfectly apt too. This species, depending on mood, will range from sandy brown (often with darker saddles across the back and reaching to near the belly) to a uniformly rich, dark mocha. This pleasing colouration is topped off by a light tan flash in only the upper ray of the caudal fin. However, there are other plecos that share a crocodilian look or chocolate colour. So, it is rhino pleco that is my favourite common name for this fish. But where is the horn? Interestingly, this species has two candidates. The much more obvious feature is the twin set of nasal flutes which rise majestically straight up from the area in front of the eyes. But there is also the single horn of raised crest atop the fish's head; a feature we only otherwise see in species of Leporacanthicus. The name scrophus is, however, not as dramatic as rhinoceros or alligator or, indeed, as marketable as chocolate. Scrophus is a form of the Latin for breeding sow. I give you the pig pleco! Or, how about the chocolate pig pleco? Or, well, maybe three is more than enough common names for this species. As you may guess from the proliferation of common names, this species is one of those that is reasonably well known to the hobby. It is exported regularly in smaller numbers from Peru. Pig pleco is quite apt really as this animal is constantly eating; it's omnivorous, will do a great job of eating algae, but will start on anything else given any opportunity. Certainly one must not rely on it surviving on algae or any amount of detritus alone. It is hardy and long-lived; certainly a life spanning a decade or more should be expected. It will adapt to a range of conditions and so it is hard to think of many larger set-ups where it would not fit right in. Indeed, if you were to ask me for the perfect companion for larger cichlids like Oscars or even Cichla species, then I think I would suggest the Rhino. It'll pig out on all that food left by the messy cichlids and, with such large fish, will weather fluctuations in water quality if parameters stray a bit from the ideal. Keeping several individuals of this species together requires space and refuge. I'd suggest a minimum territory of about 50 x 100cm containing a couple of adult sized caves per fish. So in terms of your average tank-busting cichlid set-up, fitting in two or three of these plecos would work well. Etymology Greek, pterygion, diminutive of pteryx = wing, fin + Greek, hoplon = weapon + Greek, ichthys = fish. Masculine form of "scrofa", which means "breeding sow". These plecos have large nostril two horn-like protrusions from their head that are actually nasal flutes or nostril flaps. The also have alligator-like ridges along the sides of their body. Colours range from a rich brown to black to mottled brown. Distribution South America: Marañon and Ucayali River basins. Feeding An adaptible omnivore that will eat a variety of foods, besides being a very good algae eater, supplement diet with sinking pellet foods and algae wafers. Vegetables and freeze dried foods also accepted. Furniture All but the most robust of plants tend to be eaten or uprooted. Flat stones and bogwood are required to construct caves. Will even eat floating plants. A good pleco for the deeper aquarium. Compatibility A generally peaceful fish but can be aggressive with other bottom dwellers of similar size/species if not given sufficient room. There are 96 registered keepers, view all "my cats" data.